Crystal clear, fast drying permanent glue, bonds fabrics, lace, quede, trims, ribbons and more. Ideal for all art and crafts projects, home decor projects, upholstery and household repairs. 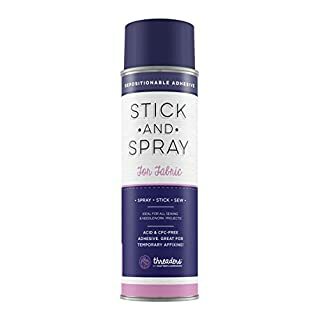 Stick and Spray for Fabric is a repositionable fabric adhesive designed to temporarily bond all fabrics. It can be used for machine applique quilting tacking. hemming and holding fabric to stabilisers in machine embroidery. The product is free from harmful acids and dispense as a fibrous mist which is odourless and colourless. It wont spot fabric or foundation material and doesn't gum sewing needles. ALEENE'S-Tack-It- Over and Over. 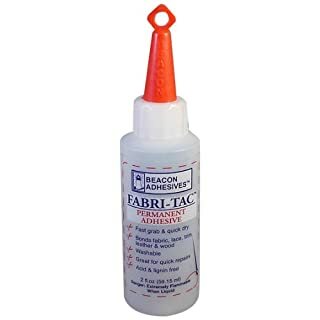 This is repositionable adhesive allows you put a temporary hold on appliques, ribbon, trim and other embellishments you can transfer from garment to garment without re- applying glue. 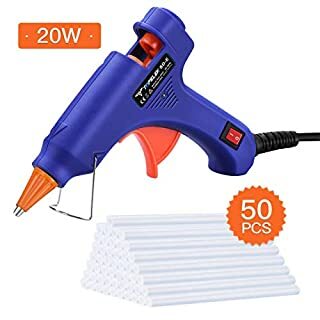 Also works on metal, wood, paper, plastic, glass, and more! 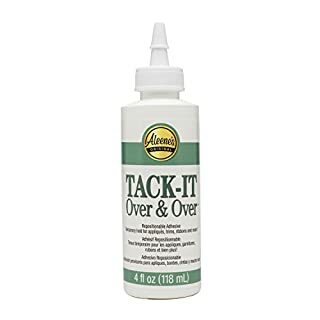 This package contains 4 fl oz of Tack-It Over and Over Adhesive. Non-toxic and Conforms to ASTM D4236. Made in USA. I Love To Create-Aleene's Fabric Fusion Needlenose Adhesive. Permanent fabric adhesive that dries crystal clear! This package contains one 2oz bottle of Fabric Fusion needlenose adhesive. Non- toxic. Conforms to ASTM D 4236. Made in USA. 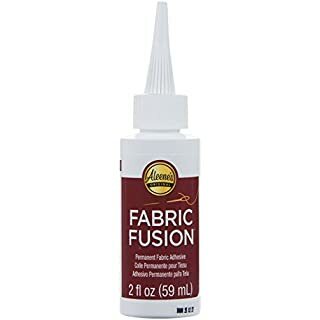 This great value fabric glue is an essential part of any sewing box. It is super-strong, it withstands dry cleaning and washing, and the bond does not degrade with age. It will boldly go where a sewing machine cannot! 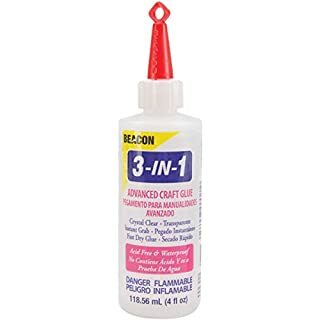 In fact, this glue has so many uses you may often find it being USEFUL to have from your sewing box. It is ideal for hemming, making soft toys, patchwork, etc. It can be used on suede, leather, cotton and blended; synthetic fibres. 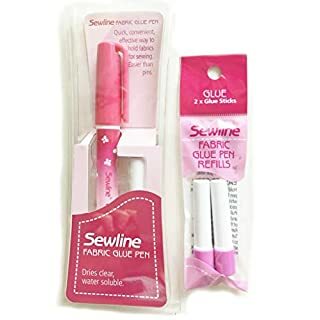 If you scroll down further, on this listing we are also selling other sewing products. You might need some of them...!!!. 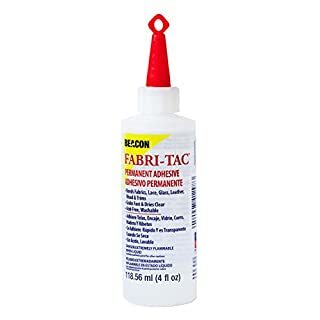 BEACON-Fabri-Tac Permanent Adhesive.Fast grabbing and quick dry.Dries clear.This permanent adhesive can bond fabric lace leather and trim.Also works well for quick repairs.Pre-wash fabric to remove sizing.Size: 2 Ounce. Bottle.Made in USA. - All purpose for Arts, Crafts, Hobbies & DIY Applications- Dries Colourless & Flexible- Extra fine precision nib! 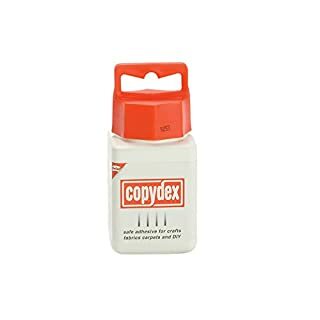 Copydex Adhesive is a safe strong glue, ideal for arts, crafts and DIY repairs. This multi-purpose latex adhesive can be used on fabric, board, carpet, leather upholstery and paper. It dries to a water-resistant bond in 20 minutes. Copydex glue is solvent free and water-based, and is resistant to washing machine cycles. With its handy integral brush, it is very easy to use and is perfect for use in the home or at school. 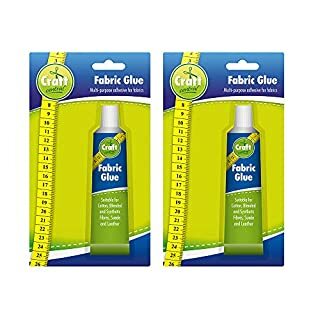 50ml Fabric Glue by Craft Central | Extra Strong & Large 1pk Fabric Glue for Clothes, Fabrics & Textiles | No More Needle and Thread as Now You Can Sew in Seconds. Our large 50ml tubes of Craft Central Material Glue are a strong, quick drying, flexible, waterproof glue for fabric that can withstand machine washing and ironing. 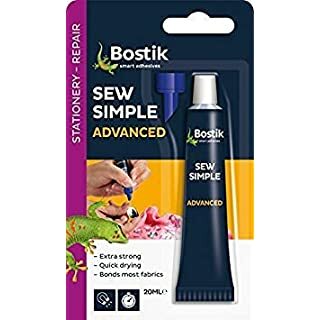 Perfect for most fabrics, such as hemming, turn-ups, curtains, clothing, labels, patchwork, badges, patches, soft toys, soft furnishings, most fabric repairs and alterations without sewing. 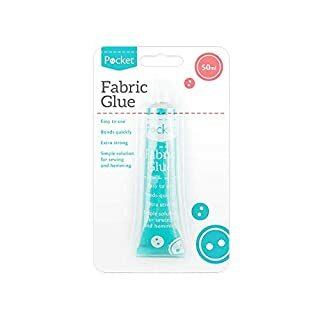 Our Waterproof Fabric Glue is a simple, quick and easy alternative to a needle and thread, ideal for hemming and using on most fabric materials such as suede, leather, blended and synthetic fibres and cotton. The item can be machine washed, ironed or dry cleaned once the glue has been applied. 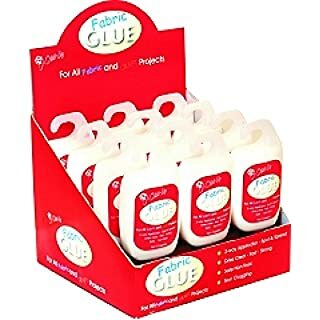 You will receive 1 large tube of 50ml Fabric Glue with every purchase. Also known as Felt Glue, Upholstery glue and badge glue. 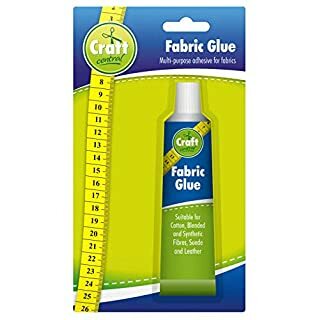 Our large 50ml tubes of Craft Central Material Glue are a strong, quick drying, flexible, waterproof glue for fabric that can withstand machine washing and ironing. Perfect for most fabrics, such as hemming, turn-ups, curtains, clothing, labels, patchwork, badges, patches, soft toys, soft furnishings, most fabric repairs and alterations without sewing. Our Waterproof Fabric Glue is a simple, quick and easy alternative to a needle and thread, ideal for hemming and using on most fabric materials such as suede, leather, blended and synthetic fibres and cotton. The item can be machine washed, ironed or dry cleaned once the glue has been applied. 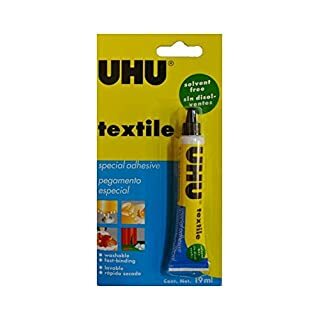 You will receive 1 large tube of 50ml Fabric Glue with every purchase. 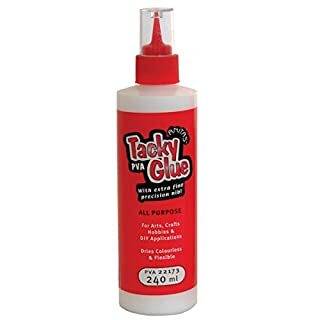 Also known as Felt Glue, Upholstery glue and badge glue. No more fiddling with pins and trying to sew round them! Ideal for English Paper Piecing and general sewing. Just run the glue pen along the fabric edge, hold the pieces together and you have a temporary bond. Goes on blue, dries clear. Washes out and will not gum up your needle. Pack contains one glue pen with one refill, plus a double refill pack (so 3 refills in total) . This textile glue is suitable for use with various materials. Using it is simple. 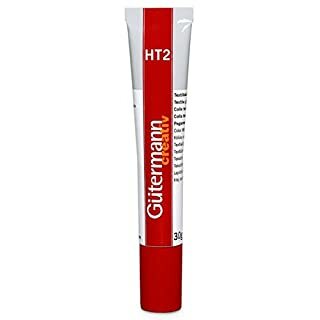 Use to glue together fabrics, trimmings, leather, PVC and much more Bonds together quickly with long-lasting hold Glued seams stay elastic Washable up to 40°C Gütermann solvent-free HT2 fabric glue 30g - directions for use with fabric: Apply to one side and allow the glue to dry for a few minutes (application depends on the fabric). Attach the pieces together and iron over for 5-10 seconds. 2 x 20ml Bostik Sew So Simple Fabric Adhesive Glue 20ml 806702 new no more sewing!